Summer 2015 is done! In the bag! Finished! Complete! (unless someone else calls in the next day or so). How was it, you might ask? BUSY!!! Over the summer I presented the following shows: The Ultra Magic Show, The Jurassic Magic Show, The Very Seussical Magic Show, The Super Marvelous Magic Show, The Magic Circus, AND The Top SECRET Magic Workshop! I performed indoors, I performed outdoors. I performed for small crowds, I performed for big crowds. I performed at Summer Camps, schools, libraries, in gyms and numerous times at an outdoor amphitheater. The farthest distance I had to drive to get to a show was 120 miles. The shortest was 1/10th of a mile. Oh, and 22 public appearances this summer, over 100 private appearances. Monkey will move into the Steampunk Illusionist Show. That is the only routine that got bumped up. One show from the line-up got it’s life extended, the Jurassic Magic show. I had originally planned on presenting that show only this summer and then retiring it again. But the popularity of the show was so huge, that I decided to add the dinosaur show to my regular line-up of shows. 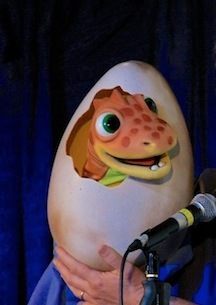 In fact, I even ordered a new dinosaur puppet! Not everything that I had planned for summer made it into the show. There was one dinosaur trick that never made it, which is fine, because that trick will now be in the school year version of the show. There were several really cool magic effects that I had planned to use in the Ultra Magic Show but they too never made it. One was making a full glass of liquid vanish into thin air. Another piece that didn’t make it into the show was a story routine, but that one is already shifted to the Steampunk show. So now that all this is over, what’s next? Well, work has already begun on the upgrades to my fall shows. The Fall-O-Ween Magic Show & The Thankfully Fun Show will be getting a special backdrop. I am contemplating adding a turkey puppet to the Thankfully Fun Show. AND there is a very cool addition to the Fall-O-Ween Magic Show, but you’re going to have to wait and see for yourself! As for The Very Merry Magic Show, well I’ve got a LOT of stuff to add to that show and it’s going to be really special this year. It’s going to be really hard to choose between the three shows this Fall….so why not choose 2 instead (or even all 3)!!! September 20, 2015 in Blog. ← 15 shows to Go and Summer is Over!